This post is sponsored by the new Art.com. I wrote earlier about Art.com’s relaunch, and if you haven’t visited the site yet, I sincerely encourage you to check it out. The collections are vast. Vast! There are literally over a million pieces to choose from. I’m partial to prints from well known artists like Matisse and Rothko. Or classic magazine cover art from Vogue or Norman Rockwell (the Rockwell’s could be so great as Christmas decorations!). But I was excited to hear they just launched a new tool: Photos to Art. It’s exactly what you’re thinking. And yes, it’s awesome. You can now upload your own photos to Art.com, and have them printed and framed in the high-end fashion you know to expect from Art.com. Think gallery-quality canvas, custom framing and wood mounting. Oh. And there’s a Photos to Art app as well — which means you can order a print of your favorite Instagram shot instantly! And since nobody wants a blurry print, the P2A app includes smart sizing – it will only show customers sizes that are appropriate for the quality of the photo they are using. Genius! Have you ever seen one of your very own photos blown up big on the wall? Handsomely framed and hanging as art? It’s a pretty incredible feeling. 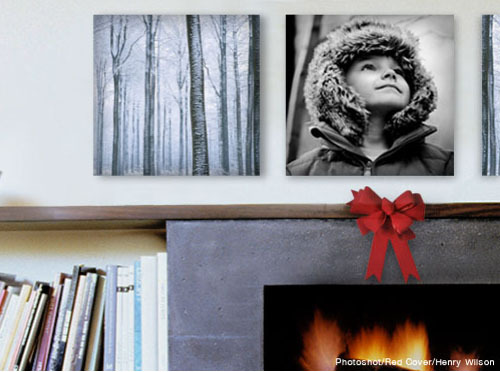 Surprise your spouse with a gallery wall of family photos for Christmas. Or order a favorite photo for Grandma and Grandpa. You know they’ll love it! Perfect timing this post – my father had just told me yesterday that he loved one of my instagram photos ( of my son standing against a fire engine tire, the same height as him) and I confessed I didn’t know what instagram prints would turn out like. Now I’ll order him a poster for Christmas.